THERE will be one last information session at Glenora this Wednesday for any local residents wanting to find out more about the proposal to introduce a town water supply in the area. 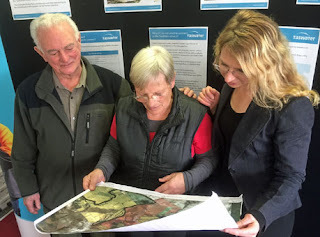 A recent decision to build a new water scheme at nearby Gretna means the same opportunity can be extended to Bushy Park and Glenora as the Gretna supply will have to connect to the Lake Fenton pipeline via Bushy Park. This will provide access to a safe supply that meets Australian Drinking Water Guidelines and the provisions of the Tasmanian Public Health Act (1997). TasWater will proceed with the proposal if there is support from about 80 per cent of the property owners who would be eligible to connect. In August the company will approach affected property owners for their decision on whether they would like to connect. Before then, residents are invited to seek more information and share their views via the TasWater website or at the community information session at the Glenora Online Access Centre, Gordon River Rd, any time between 1-3pm this Wednesday, July 29. For more information phone TasWater community engagement officer Miriam Rule on 6237 8852 or send an email. A minute's silence for "Whip"
Crikey ABC, how wrong can you be? Did you see the Granton crash?